Look at me, again in shorts! Haha. I do wear non-dress/skirt stuff but it rarely makes it's way to the blog. These shorts have zebras all over it (sorry for lack of better detailed pics! This shoot was something along the lines of a "comedy of errors") and I'm a sucker for anything safari themed. Because the zebras embroidered onto the shorts are small, it was easy to mix prints with a striped shirt and actual zebra striped shoes! I like shorts this time of year with long sleeves because you can still keep warm but flirt with the weather getting warmer. Remember, things ebb and flow in life. Sometimes we really do go through sucky patches. But often times things turn a corner, whether it's subtle or whether it's overnight. Try to be mindful of that when things aren't going your way! Wahoo! I get to talk about The Breeders again! (I've been on a major Breeders kick this spring!) I think they're the most underrated band of the 90s, in regards to nostalgia factor and what people immediately remember upon thinking about the 90s. Here's a song of theirs, appropriately called "Safari" for my zebra themed outfit. It really shows off the beauty of Kim Deal's vocals, so it's a worth a listen if you haven't heard it! Happy Monday everyone! 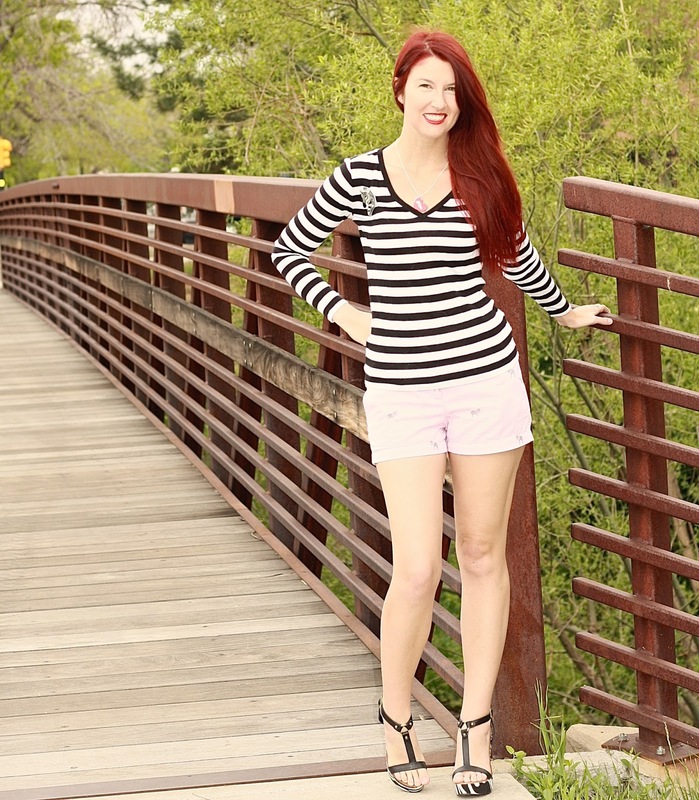 Such a cute white shorts and striped shirt combo! Love these blush shorts! They are too cute with the striped shirt! It would've been nice to see the zebra's up close but I can make them out and either way that's a fun print! I've always kinda liked zebras and I like how it's actual zebras instead of just the typical zebra print you normally see. Oh, how cute are these shorts! cute, love the color of those shorts! Amazing outfit, love this color combine! Look at you in this cute combo! I love the black and white stripes with the pink shorts. These zebras on your shorts are so adorable, I really like them and Lauren, honestly, you should wear shorts more often, you have great legs, dear! This is such a cute outfit, Lauren! I adore your shirt and those shorts are too cute! Thanks so much for sharing and I hope you're having a great start to your week so far! Shorts and a longsleeved shirt is such a perfect combination! I'm loving all the black and white in this outfit, along with the subtle pink of the shorts! The zebra theme is so cool! Loving the shoes, obsessed! These zebra shorts are seriosuly cute! I love the zebra wedges too. They really stand out. Haha, you know, I do wear non skirt/dresses too, but that stuff doesn't always appear on my blog. Occasionally it will. Are zebras your favorite zoo type animal? I love these shorts. You look so adorable in this outfit. Also, your hair looks amazing. You will have to start sharing some of your beauty secrets with the rest of us. What do you think? Also, what do you think about scalloped shorts? They are trending, but I haven't made a decision as to whether I like them or not just yet. Have you tried them on? So fun! I love the zebra shoes with this outfit, your zebra brooch and of course the cute little zebras on your shorts! So cute! Very fun outfit! Your Erstwilder brooch is slaying me. I'm such a huge fan of their adorable + chic offerings.